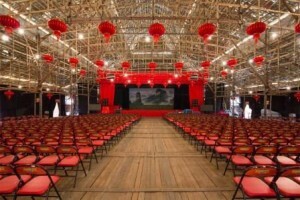 Since 2012, a huge bamboo theatre has sprung up each year in West Kowloon in time for the Chinese New Year period. The 800-seat theatres take only weeks to construct. The theatres are temporary structures designed by architects using both traditional and modern architectural design. Ten specialist bamboo craftsman use more than 10,000 bamboo poles to build the theatres. According the architect of the 2012 theatre, William Lim, the design of the bamboo theatre is based on what bamboo theatres looked like in the 1950s and ’60s. These were both stages for performances and venues for banquets. The bamboo theatres are usually erected without the aid of a detailed floor plan and construction generally involves lots of improvising. 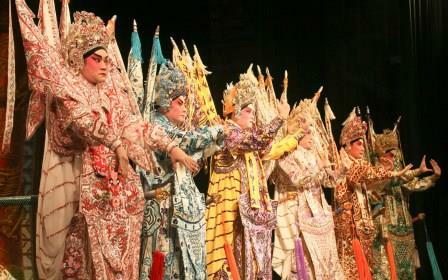 Each year the theatre provides a programme of extremely popular xiqu (Chinese opera) performances. In its first year, the five day festival sold out. The 2013 festival ran for three weeks and was the programme was expanded to include contemporary music and dance performances. Also, a handicraft and food fair was set up outside the theatre. 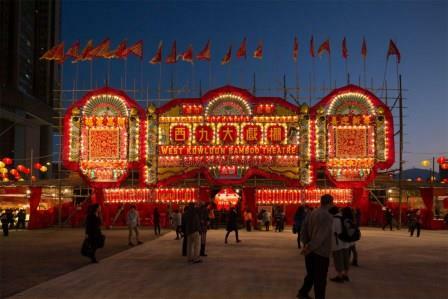 The fair is laid out in such a way to help visitors appreciate the architecture of the bamboo theatre. In 2013, the fair alone attracted more than one hundred thousand people. The 2014 festival ran for one month. Under construction now is the new Xiqu Centre. The design was unanimously selected from a short-list of five by a jury panel. The Xiqu Centre will be part of the 40 hectare West Kowloon Cultural District. The precinct, built on reclaimed land, will also include 23 hectares of public open space, museums, art galleries, and exhibition centres. This entry was posted in All, Bamboo around the world and tagged architecture, art, bamboo, Hong Kong on 26/10/2014 by Deb.